London based studio Campaign has collaborated with the men’s luxury brand Dunhill on NY11-18-02-10. 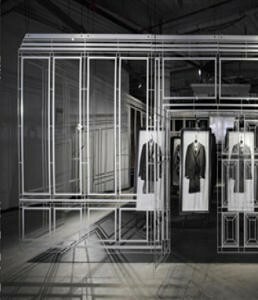 Dunhill commissioned Campaign to realize their vision for a temporary installation at the New York Fashion Week, a vision that challenged the possibility of moving the grandeur of the brand’s home in London to NYC momentarily.Taking up residence in one of the last remaining archetypal disused warehouse spaces in the meatpacking district of the city, NY 11-18-02-10 recreates Bourdon House, the home of Alfred Dunhill in London, offering a rare opportunity to experience the unique atmosphere of this extraordinary Georgian London House.The installation recreates an ethereal facade of Bourdon House with 22 separate 3m x 1.5m and 2mm thin, laser-cut white powder-coated aluminium panels. The panels are suspended from the ceiling using unistruts and hover dramatically over a black PVC floor. A life-sized vinyl of the Bourdon House exterior and its Mayfair environs completes the streetscape. The drama and theatricality of the space are further heightened through the use of photographic lights in an arrangement designed in collaboration with New York Photographer Frank Oudeman.